1. What is ONE thing or area in your home or life you hope to report is completely organized when 2013 draws to a close? Do you have a plan to make it happen? I'm a pretty organized person to begin with, which makes this question hard for me to answer. 2. What's the worst uniform you've ever had to wear for a job? What comes to mind first was not a job. 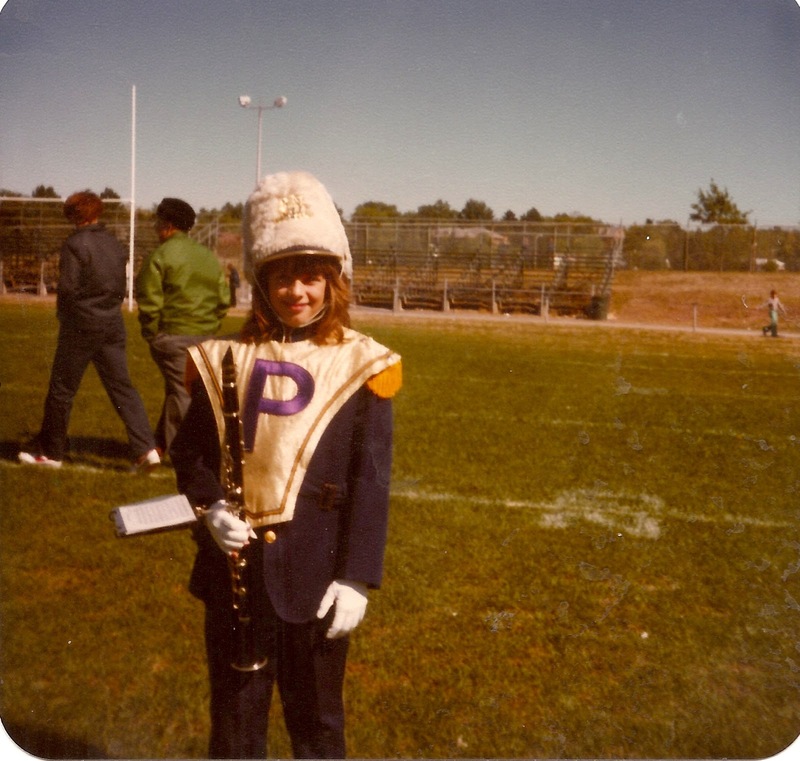 When I was in middle school, our band had the ugliest uniforms. I still cringe looking back at photos! 3. What was your last kitchen 'mishap'? This question comes to you courtesy of Bettywho blogs over at A Glimpse Into Midlife...everyone go say hi to Betty! Burning a batch of Christmas cookies. Not one of my finer moments. 4. How do you protect yourself from other people's negativity? Growing up in a dysfunctional home, I have built a wall up. That tough skin helps, but negative comments directed towards me still hurt. Negative people in general annoy me. I walk away and surround myself with positive friends. 5. Who in your family do you most resemble (physically)? If you have children, who do people say they favor? Do you agree? My features are a combination of my father and my maternal grandmother. 6. January 8th is National Bubble Bath Day...will you be celebrating? My skin gets dried out when I use fragrance soaps. Even though it's fun… I have to skip it. 7. Some of the 'world's best winter festivals' are - Mardi Gras (New Orleans),Quebec Winter Festival (Canada), Sundance Film Festival (Park City, Utah), Rio Carnivale (Brazil), Sapporo Snow Festival (Japan), Venice Carnivale(Italy) and the Harbin Ice Festival (Northern China). Of those listed (and if cost were not a factor) which would you most like to attend and why? Quebec Winter Festival . My reason has nothing to do with the festival itself. Purely selfish reasons. I'd like to visit RoryBore from Time Out For Mom, who lives in Canada. I've become fast friends with her and I think it would be neat to meet her. NHL HOCKEY LOCK OUT IS O.V.E.R!!!!!!!!!!!!!!! I guess you will get back on the hockey bandwagon. I hear many fans are going start their own boycott. Fragrance soaps do that to me too... so much bad stuff in them. Love the band uniform!!! They still are kinda similar today - arent they? Wow that is some uniform classic now! Everyone around here is also pretty happy about Hockey again! Have a great day! I know there are some happy peeps at your house : ) I'm glad it's back too because I'm not a fan of pro Basketball and that's about the only option this time of year if there's no hockey. You reminded me of the awful p.e. uniforms we had to wear in Junior high. Kind of an industrial blue 'onesie' with snaps up the front. Yuck! I hate basketball because of the sneaker squeaking. Drives me insane! My PE class had a blue and white striped shirt that reminded you of a jail uniform. Yuck is right! I feel sorry for the kids if they do! Thanks for stopping by Josanne. I'm glad you did. Have a wonderful day too! Sometimes people just don't click. I have learned not to take offense to people who seems a bit cold, just because they could be shy. It will be hard for the NHL to drum up fan support after all the drama they caused. FYI.. I tried clicking on your blog and it said it was blocked?? I love your remark in the comments about cold people really being shy. Thats how I am and most people until they know me think I am standoffish and once you know me you would swear I wasn't at all shy. But I have learned to force myself to be outgoing because then I feel less awkward than if I don't talk at all. Inside I am still the same horribly shy person :) Thanks for visiting my blog. I just love your purple blog. Purple is one of my favorite colors. As you can tell, purple is my favorite color!